Priyanka Chopra and Nick Jonas shared official wedding portraits from their weekend nuptials. Though the two posted casual photos from their wedding in Jodhpur, India over the weekend, the new photos show Chopra's two stunning wedding outfits. The couple shared a photo from their Indian wedding ceremony, in which Chopra wore a deep red beaded lehenga by Sabyasachi. The designer revealed on Instagram that "110 embroiderers from Calcutta, India took 3720 hours to create this modern masterpiece." The lehenga — a traditional floor-length skirt with bare midriff — also featured hand-embroidered and hand-cut organza flowers. Chopra captioned her photo, "And forever starts now..." while Jonas wrote that it was "happiest day" of his life. The actress's Western wedding ensemble was equally stunning, with a sheer, high-necked, hand-beaded and embroidered gown from Ralph Lauren. Chopra also wore a 75-foot long veil, captured in drone footage. Chopra and Jonas talked to People about their wedding. 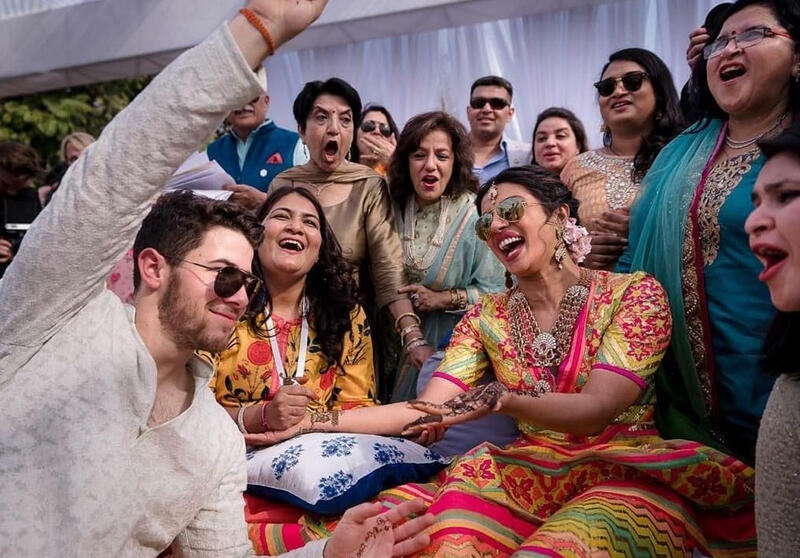 On Friday, the couple took part in Indian wedding traditions including a mehendi ceremony and a sangeet, during which both families performed musical numbers. Then on Saturday, the couple had a Western ceremony, with Chopra's mother walking her down the aisle. The actress's father died of cancer in 2013. Both the actress and her musician husband said they were very emotional. "It was all tears. All tears," Chopra told People. "I could not hold it in. I think I was nervous and scared. But as soon as the curtains opened, and I saw his face it was just like everything settled and I knew I was making the best decision of my life." Jonas added, "The emotions were running high during the ceremonies, I think especially during the Western wedding for me. You know you think your whole life about that moment. Honestly, I could not have imagined it would be as perfect as it was. It was highly emotional."